My girls have been inspired by David Levithan. His book, Every Day, finishes with the main character sticking post it notes all over another character’s bedroom. The girls have been inspired. Now their room is plastered with post-its. Ohana means family. Family means no-one gets left behind or forgotten. If you’re not willing to risk it all, you don’t want it bad enough. The girls have taken this one step further. Daughter number one is not shy about letting the world know she believes she’s awesome. 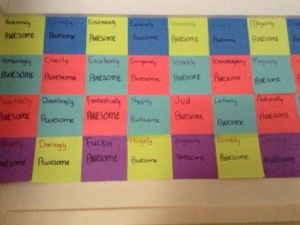 She and daughter number two have applied the awesomeness concept to the post it concept. For each letter of the alphabet, they’ve found an adjective or two to go with awesome. They’ve put this above their bedroom door, so they see it every time they leave their bedroom. Pretty impressive affirmation for a pair of teenage girls. Long may it continue! I thoroughly recommend ‘Every Day’ by the way – excellent young adult novel!